Minnesota is one of the best-educated states in the Union, ranking second in the nation (behind only Massachusetts) in the number of working-age residents with an associate degree or higher. One reason for Minnesota's well-educated population is the number of high quality colleges and universities in the state. From public universities to small private colleges to trade schools offering numerous skills and technologies, students in Minnesota have many options for pursuing higher education. 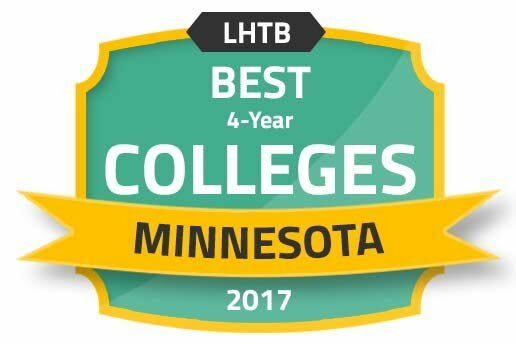 This guide presents an overview of the best colleges in Minnesota, pointers on which might be most affordable, and which might have the best outlook for graduates. Read on for rankings, lists and college planning programs about Minnesota colleges. Not all institutions of higher learning are created equal. From cost of attendance to class size to the number of programs available for study, each school has its advantages and disadvantages, depending on the student's perspective and academic goals. Our ranking of the best Minnesota colleges takes some guesswork out of the process of choosing by looking at hard statistics such as student-to-teacher ratio, tuition and graduation rate. What if the goal is to search through specific criteria and compare the results? That's what students get with this search tool, which allows them to drill down on certain criteria, such as tuition rates or student population, and then compare the schools that meet those guidelines. The result is a nice way to help students narrow down their short list of potential colleges in Minnesota. Preparing for college is not easy. It takes hard work and careful planning to find the financial resources and build up the academic record needed to successfully transition from high school to college. Once in higher education, many students could use assistance in maximizing their college experience, transitioning to college life and preparing for the working world after graduation. There are many resources available to help students do all of this. Here are just a few. The Minnesota Education Equity Partnership's (MNEEP) goal is for all students to have equal access to education in Minnesota regardless of their race, class, creed or nationality. Utilizing a multifaceted approach, the MNEEP takes various steps to achieve that educational equality, including educating policy makers to recognize the advantages of promoting a diverse students body, empowering students and families to reach for their academic and professional goals, improving college access and addressing school discipline disparities among different types of students based on their race. This initiative helps Minnesota students and families take full advantage of the Free Application for Federal Student Aid (FAFSA). Consisting of volunteers, the program connects financial experts with families of students who plan to attend college. Between February and May, numerous FAFSA workshops are offered in locations all over Minnesota. Special attention goes to low income families or those who have no prior college graduates. MCG helps students find all the financial aid possible in order to make college easier. This long-term, low-interest loan is administered by the Minnesota Office of Higher Education. The loan has either a fixed interest rate, currently 6.5%, or a variable rate which is often a bit lower. In order to be eligible, students must be attending school at least part-time, make satisfactory academic progress, and be current on any other student loan payments. The program has a cumulative limit of $100,000 for a four-year program, $140,000 for a graduate school program, and much lower amounts for associate, certificate or other programs. Most students who attend college in Minnesota will not have the benefit of free tuition or a scholarship that pays for everything. As a result, the cost of a particular school will be one of the most important considerations. How do the colleges in Minnesota stack up to each other and the rest of the colleges across the United States? We did the research to help aspiring students make informed decisions. Tuition is not the only number prospective students should research; some schools will offer more scholarships and financial aid options than others do. Therefore, the actual cost of attendance can be substantially different between schools, even if they have similar base tuitions. The following is a list of the most affordable colleges in Minnesota based on the actual cost of attendance, calculated by subtracting the typical financial aid package from the tuition rate. If college is an investment, an individual needs to know what the return on the investment is before deciding to take it on. This section looks at what graduates from the top six schools in Minnesota are actually making. Earning figures spanning 10 years after graduating, as well as comparisons between Minnesota and national averages, are all included here. A high salary after graduating college is great, but must be put into perspective-and few things will do that faster than student loan debt. The following ranking shows what students who graduate from Minnesota colleges might expect from student debt. What Does it Cost Students to Live in Minnesota? In addition to worrying about tuition and financial aid, students must also consider the costs in the area where they might live for two years, four years or longer. The cost of living in Minnesota tends to be a bit higher than the national average in every category, which is why it is so important for students to do serious research into what to expect financially. The following table compares the cost of living in metro areas of the state, as well as the national average. College isn't easy or cheap, so when choosing which one to attend, prospective students want to know their degree will pay off. While many things can affect whether a college degree from a particular school is worth it, accreditation should always be at the top of a student's wish list. Accreditation ensures a school has been evaluated by an independent body and proven to have consistent, high-quality programs. University of Minnesota's Carlson School of Management is accredited by the Association to Advance Collegiate Schools of Business (AACSB). Bethel University's nursing school is accredited by the Commission on Collegiate Nursing Education (CCNE). Mankato is known for its excellent parks, trails and opportunities for outdoor activities. It's also known as a great college town with multiple colleges and universities. Plenty of students have recognized the perks offered by the city, such as a shorter commute, a revitalized downtown and a quite young population, with a growing number of residents under the age of 34. Here are some of the colleges students might choose to attend in Mankato. Minnesota State University-Mankato was founded in 1868 and boasts a student body of over 15,000. Students have the opportunity to study in over 130 undergraduate and 75 graduate programs in fields such as business, humanities, allied health and behavioral sciences. The university is well-known for its research, including partnerships with the Center on Aging, Water Resources Center and Space Image Processing Center. Started in 1927, Bethany Lutheran College has worked to provide a high quality college education that is in line with the Bible and Lutheran Confessions. Operated by the Evangelical Lutheran Synod, the college provides students the opportunity to study in 20 majors, including American studies, media arts and business administration. The professors at this small school are readily available for additional help and instruction, both inside and outside the classroom. South Central College is a two-year college serving over 5,000 students. The academic offerings vary widely, with over 50 technical and professional programs to go along with many associate degree curriculums. Many associate degree programs are designed to allow graduates to move seamlessly into a four-year degree. Some areas of study offered include accounting, culinary arts, carpentry and small business management. Minneapolis-Saint Paul is made up of two cities, but due to their proximity to each other, the cities are considered one metropolitan area. With such a large metropolitan area, it's no surprise that there are more than 30 colleges and universities in the area. In addition to enjoying the vast number of schools that might fit their needs, students will be happy to know they will graduate into an area with one of the lowest unemployment rates in the nation. Here are just a few of the institutions of higher learning students should consider. The University of Minnesota-Twin Cities is Minnesota's keystone public university. Established in 1851, the school also has campuses in other locations, such as Duluth, Rochester and Morris. Over 46,000 students attend the university and take advantage of the diverse academic offerings. There are over 200 graduate and undergraduate degree programs available in almost any subject, including law, horticulture, urban regional planning and interior design. Founded in 1886, the Minneapolis College of Art and Design provides elite art and design instruction and formal degrees to students in the Twin Cities region. Attention paid to students is top-notch, with a faculty to student ratio of 10 to 1 and a student body comprised of only 700 to 800 students from all over the world. The bulk of the curriculum covers art and design subjects; however, students will still get a well-rounded education, with approximately a third of the curriculum covering liberal arts topics. The student body of Minneapolis Community and Technical College consists of about 13,000, who surely appreciate the school's convenient location in downtown Minneapolis. In addition to a vibrant on campus experience, students have many academic options available to them, including associate degrees, certificate and diploma programs in over 120 areas. In fact, Minneapolis Community and Technical College is the most comprehensive two-year college in Minnesota. Prospective students interested in attending Minnesota colleges will want to learn how to apply, how to pay for school, and what transfer options may be available. The following list of resources is a great place to begin. Resources provided include career exploration tools, which help students best utilize their interests and skills. For those not yet in college, college-planning tools can help students figure out which school is right for them and how to pay for it. This is a version of the popular 529 college savings plan. What makes this savings plan special is the tax and estate planning benefits it receives. For reliable and readily available consumer information about colleges and universities in Minnesota, this website is one of the first places prospective students should visit. The MSCSA is comprised of students who are attending public, two-year colleges, with the goal of promoting high quality two-year college education to students. This resource helps with college transfers. A plethora of information is available, such as an explanation of the transfer process, financial aid considerations and the transfer application process. The Minnesota Private College Council represents various private and nonprofit liberal arts colleges and universities. In connection with the Minnesota Private College Fund, the council helps low and middle income families pay for tuition. This is Minnesota's information hub for high school students looking for ways to achieve college credits while still in high school.